Every year, 130,000 square kilometers of rainforest disappear from the face of Earth — an area equivalent to the size of Greece. The majority of this land is cleared for agricultural development — even in tropical mountain areas. These fields are quickly overgrown with weeds, however. Bracken is particularly tenacious. It cannot be permanently eliminated using herbicides or by burning the land. As a result, farmers often abandon the land after a few short years and start clearing new areas of forest. The team did not just look at economic benefit when evaluating the different concepts. For the first time, this study also took environmental and socio-cultural criteria into consideration, factoring in issues such as the amount of carbon dioxide and nitrogen assimilated by plants and soil, biomass production, soil quality, impact on climate, water management and acceptance among farmers. Afforestation with alder and pine species proved particularly sustainable. In addition, forested regions offer the best protection against erosion in the long term. “Our study also showed that afforestation with the native Andean alder had a much more positive impact on the climate and water balance than the other land use options,” adds Prof. Jörg Bendix from Phillips-Universität Marburg. Typical rainforest flora and fauna are also able to gradually recolonize afforested regions. Intense pasturing scored much higher on the ecological scale than extensive pasturing. Economic benefits stemmed from the sale of wood (afforestation) or the sale of meat and milk (pasturing). Alder plantations achieved the greatest financial returns. A survey conducted among land users showed that the majority of livestock farmers also viewed afforestation as the best land use option due to the positive ecological balance and greater long-term earnings potential. “If we want recultivation concepts to be a success, the people using the land have to be engaged,” elaborates Bendix. The sustainable land use concepts all come at a cost, however. Over a period of twenty years, farmers who do not use slash-and-burn techniques are exposed to an annual loss of earnings. This amounts to 87 dollars per hectare for afforestation and 100 dollars per hectare for intense pasturing. The researchers regard compensation for recultivation as an important incentive for encouraging famers to replant abandoned grazing land. In the long term, trade with CO2 certificates could also provide an additional source of income. The researchers also believe that their study could be used as a reference for evaluating recultivation concepts in other tropical mountain forests, for example in Brazil or Africa. “Abandoned agricultural land is a huge resource that is not being harnessed,” summarizes Thomas Knoke. “The German Research Foundation (DFG) is currently funding a number of projects that are working with farmers in Ecuador to implement the findings of the study,” concludes Erwin Beck, professor at the University of Bayreuth and the man who started the project in Ecuador 17 years ago. The above story is based on materials provided by Technische Universitaet Muenchen. Note: Materials may be edited for content and length. The intense farming practices of the “Green Revolution” are powerful enough to alter Earth’s atmosphere at an ever-increasing rate, boosting the seasonal amplitude in atmospheric carbon dioxide to about 15 percent over the past five decades. That’s the key finding of a new atmospheric model developed by University of Maryland researchers, which estimates that on average, the amplitude of the seasonal oscillation of carbon dioxide in the atmosphere is increasing at a rate of 0.3 percent every year. A study based on the results of the model, called VEGAS, was published Nov. 20, 2014 in the journal Nature. Scientists have known since the 1950s that carbon dioxide levels in the atmosphere hit an annual low during late summer and early fall in the Northern Hemisphere, which has a greater continental landmass than the Southern Hemisphere, and therefore has more plant life. The atmosphere’s carbon dioxide level falls in spring and summer as all the hemisphere’s plants reach their maximum growth, taking in carbon dioxide and releasing oxygen. In the autumn, when the hemisphere’s plants are decomposing and releasing stored carbon, the atmosphere’s carbon dioxide levels rapidly increase. In a set of historic observations taken continuously since 1958 at Hawaii’s Mauna Loa Observatory, and later in other places including Barrow, Alaska, researchers have tracked these seasonal peaks and valleys, which clearly show an increase in the atmosphere’s overall level of carbon dioxide, Earth’s main greenhouse gas. Between 1961 and 2010, the seasonal variation has also become more extreme. Carbon dioxide levels are currently about 6 parts per million higher in the Northern Hemisphere’s winter than in summer. While the forces driving the overall increase in carbon dioxide are well understood, the reasons behind the steepening of the seasonal carbon dioxide cycle are harder to pin down. Because plants breathe in carbon dioxide, higher atmospheric levels of the gas can stimulate plant growth, and this so-called “carbon dioxide fertilization effect” probably plays a role. Climate scientists also point to the warming in the Northern Hemisphere high latitudes that makes plants grow better in cold regions as an important factor. But even taken together, those factors cannot fully account for the trend and spatial patterns toward increasing seasonal change, said Zeng. Zeng points out that between 1961 and 2010, the amount of land planted with major crops grew by 20 percent, but crop production tripled. The combination of factors known as the Green Revolution–improved irrigation, increased use of manufactured fertilizer, and higher-yield strains of corn, wheat, rice and other crops–must have led not only to increased crop productivity, but also to increases in plants’ seasonal growth and decay and the amount of carbon dioxide they release to the atmosphere, he reasoned. UMD graduate student Fang Zhao and other collaborators worked with Zeng, who developed the first of several versions of the VEGAS model in 2000, to add information on worldwide crop production. The researchers combined country-by-country statistics collected yearly by the United Nations Food and Agricultural Organization (FAO) with climate data and observations of atmospheric carbon dioxide levels from several sites. To ensure that their results did not overstate the Green Revolution’s effect, the researchers ran their model using an estimate of worldwide crop production slightly lower than the FAO statistics. Once the Green Revolution was factored in, VEGAS’ results generally tracked the actual carbon dioxide peaks and valleys recorded at Mauna Loa. Between 1975 and 1985, carbon dioxide levels rose faster at Mauna Loa than they did in the model, but this could be due to regional weather patterns, Zeng said. Other atmospheric models factor in changes in land use, from natural vegetation to cropland, Zeng said, but the VEGAS results described in Nature are the first to track the effect of changes in the intensity of farming methods. There are still many unknowns. For example, the Green Revolution has not affected all parts of the world equally, and there isn’t enough detailed information about changing farming practices over the past 50 years to build those detailed variations into the model. The above story is based on materials provided by University of Maryland. The original article was written by Heather Dewar. Note: Materials may be edited for content and length. By analysing DNA extracted from the petrous bones of skulls of ancient Europeans, scientists have identified that these peoples remained intolerant to lactose (natural sugar in the milk of mammals) for 5,000 years after they adopted agricultural practices and 4,000 years after the onset of cheese-making among Central European Neolithic farmers. The findings published online in the scientific journal Nature Communications (21 Oct) also suggest that major technological transitions in Central Europe between the Neolithic, Bronze Age and Iron Age were also associated with major changes in the genetics of these populations. For the study, the international team of scientists examined nuclear ancient DNA extracted from thirteen individuals from burials from archaeological sites located in the Great Hungarian Plain, an area known to have been at the crossroads of major cultural transformations that shaped European prehistory. The skeletons sampled date from 5,700 BC (Early Neolithic) to 800 BC (Iron Age). It took several years of experimentation with different bones of varying density and DNA preservation for the scientists to discover that the inner ear region of the petrous bone in the skull, which is the hardest bone and well protected from damage, is ideal for ancient DNA analysis in humans and any other mammals. For the first time, these exceptionally high percentage DNA yields from ancient remains made it possible for scientists to systematically analyse a series of skeletons from the same region and check for known genetic markers including lactose intolerance. “Our findings show progression towards lighter skin pigmentation as hunter and gatherers and non-local farmers intermarried, but surprisingly no presence of increased lactose persistence or tolerance to lactose” adds Professor Pinhasi. The above story is based on materials provided by University College Dublin. Note: Materials may be edited for content and length. A quantitative model for measuring sustainability in the Finnish agricultural sector has been developed in a new thesis. The new model challenges the OECD method, which is currently used when evaluating areas of potential pollution from nutrients. Research scientist Natalia Kuosmanen at MTT Agrifood Research Finland says defining sustainability quantitatively is challenging due to variety of meanings attached to this commonly used concept. “What gets measured gets done, as the saying goes. The same truth applies to sustainability. Can we define sustainability and assess it, if we do not have the exact means to measure it?” Kuosmanen asks. In her thesis, Kuosmanen used established methods of frontier estimation to evaluate sustainability performance of Finnish dairy farms. The methods are commonly applied for productivity and efficiency analysis in banking and industry. Moreover, her thesis include a new dynamic approach to model nutrient stocks and flows. The new model was developed in the Finnish agricultural sector, where the stocks and flows of nitrogen and phosphorus were estimated from a 48-year period. It was, furthermore, applied in the data of 14 EU countries in the period between 1961 and 2009. Currently, the static nutrient balance approach of OECD is used to assess nutrient emissions from agriculture. “The new dynamic nutrient balance model has several advantages compared with the conventional static approaches. The static approach ignores the accumulation of nutrients in the environment and overlooks the dynamic nature of the nutrient cycles,” Kuosmanen says. Kuosmanen’s dynamic model enables the analysis of the development of nutrient stock over time and the distribution of the nutrient flows into water, air and soil. The stocks and outflows from the stock calculated using the dynamic model could be utilized in sustainability assessment as indicators of environmental pressure from agriculture. When applied to farm and country level data, the results reveal that the nutrient outflows are much more stable over time compared with the net inflows. Currently, the net inflow is widely used as an agri-environmental indicator to support policy making in Europe and in other developed countries. “Unfortunately, this indicator is sensitive to random fluctuations due to weather, measurement errors and other noise in data, which may result in significant under- or overestimation of the nutrient emissions in short term assessments. Our results demonstrate that the nutrient outflow, calculated using the dynamic nutrient balance model, provides a more reliable and robust indicator for the purposes of evaluating and designing national and the EU-level agri-environmental policies,” Kuosmanen argues. The above story is based on materials provided by MTT Agrifood Research Finland. Note: Materials may be edited for content and length. 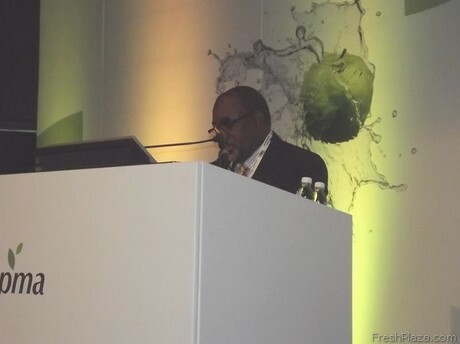 At the PMA Fresh Connections South Africa, recently held in Pretoria, Mr Barthelemy Mumba, Minister of Agriculture, Fisheries and Livestock of the Republic of Congo’s southern Katanga province, gave a speech on his country’s efforts to attract foreign investment and promote domestic agriculture. “The Katanga province, with 497,000 square kilometres, is larger than California and 16 times larger than Belgium; it has 12,000,000 hectares of fertile lands, so when talking about economic expansion, our province is a great case study,” affirms Mr Mumba. The long-term goal, in cooperation with South Africa, is to finish with the country’s issues and encourage technological investments in the agricultural sector, from which both countries could mutually benefit, as Katanga’s development would allow South Africa to significantly reduce the cost of imports. “Katanga is open for business; the Government is aware of the province’s potential and its commitment is to boost agriculture,” concludes Mr Barthelemy Mumba. Climate change may expand suitable cropland, particularly in the Northern high latitudes, but tropical regions may becoming decreasingly suitable, according to a study published September 17, 2014 in the open-access journal PLOS ONE by Florian Zabel from Ludwig Maximilians University, Germany and colleagues. Most of the Earth’s accessible agricultural land are already under cultivation. Ecological factors such as climate, soil quality, water supply and topography determine the suitability of land for agriculture. Climate change may impact global agriculture, but some regions may benefit from it. In a new study, researchers focused on the probable impact of climate change on the supply of land suitable for the cultivation of the 16 major food and energy crops worldwide, including staples such as maize, rice, soybeans and wheat. They simulated the impact of climate change on agricultural production over the course of the 21st century and found that two-thirds of all land potentially suitable for agricultural use is already under cultivation. The results indicate that climate change may expand the supply of cropland in the high latitudes of the Northern hemisphere, including Canada, Russia, China, over the next 100 years. However, in the absence of adaptation measures such as increased irrigation, the simulation projects a significant loss of suitable agricultural land in Mediterranean regions and in parts of Sub-Saharan Africa. The land suitable for agricultural would be about 54 million km2 — and of this, 91% is already under cultivation. “Much of the additional area is, however, at best only moderately suited to agricultural use, so the proportion of highly fertile land used for crop production will decrease,” says Zabel. Moreover, in the tropical regions of Brazil, Asia and Central Africa, climate change will significantly reduce the chance of obtaining multiple harvests per year. “In the context of current projections, which predict that the demand for food will double by the year 2050 as the result of population increase, our results are quite alarming. In addition, one must consider the prospect of increased pressure on land resources for the cultivation of forage crops and animal feed owing to rising demand for meat, and the expansion of land use for the production of bioenergy,” says Zabel. The above story is based on materials provided by PLOS. Note: Materials may be edited for content and length. A comprehensive new analysis released today says that nearly half (49%) of all recent tropical deforestation is the result of illegal clearing for commercial agriculture. The study also finds that the majority of this illegal destruction was driven by overseas demand for agricultural commodities including palm oil, beef, soy, and wood products. In addition to devastating impacts on forest-dependent people and biodiversity, the illegal conversion of tropical forests for commercial agriculture is estimated to produce 1.47 gigatonnes of carbon each year — equivalent to 25% of the EU’s annual fossil fuel-based emissions. “We’ve known that the production of agricultural commodities is a principal driving force behind deforestation, but this is the first report to show the outsize role that illegal activities play in the production of hundreds of food and household products consumed worldwide,” said Michael Jenkins, President and CEO of Forest Trends, a Washington-based NGO that published the report. According to the study, Consumer Goods and Deforestation: An Analysis of the Extent and Nature of Illegality in Forest Conversion for Agriculture, 90% of the deforestation in Brazil from 2000 to 2012 was illegal, primarily due to the failure to conserve a percentage of natural forests in large-scale cattle and soy plantations, as required by Brazilian law. (Much of this occurred prior to 2004, when the Brazilian government took steps to successfully reduce deforestation.) And in the forests of Indonesia, 80% of deforestation was illegal — mostly for large-scale plantations producing palm oil and timber, 75% of which is exported. While other countries also experience high levels of illegal deforestation, Brazil and Indonesia produce the highest level of agricultural commodities destined for global markets, many of which wind up in cosmetics or household goods (palm oil), animal feed (soy), and packaging (wood products). In Papua New Guinea, millions of hectares of forest have been illegally licensed for deforestation in recent years; a recent Parliamentary inquiry in the country found that 90% of these licenses were issued by corrupt or fraudulent means. In Tanzania, forests have been illegally razed to make way for jatropha, a plant commonly used to produce biofuels. Cambodia, along with neighboring Laos, is experiencing unprecedented growth in commercial agriculture. By the end of 2012, the government handed 2.6 million hectares of land, much of it forested, to large-scale agriculture producers. In Bolivia, soy — 75% of which is exported — is the main engine behind illegal deforestation in the country’s stretch of Amazon. In most cases, the companies that illegally razed forests to grow these crops had some form of government permit in hand. However, the report finds that it was also often the case that these permits were corruptly issued or fraudulently obtained; that these companies were missing additional required permits and licenses; or that these companies violated laws when clearing and planting, causing significant negative impacts on the environment and the rights of local people who have lived in these forests for generations and who depend on them for their food and incomes. “All over the tropics, companies are bribing officials to obtain permits, trampling the legal or customary rights of Indigenous Peoples and other forest-dwelling communities, clearing more forest than they are allowed, and causing pollution and environmental devastation by flouting the law,” said Sam Lawson, the report author. According to the report, the international trade in agricultural commodities (beef, leather, soy, palm oil, and wood products, including paper) produced on land illegally converted from tropical forest is worth an estimated US$ 61 billion per year. The EU, China, India, Russia, and the US are among the largest buyers of these commodities. Overall, exports of agricultural commodities produced on land where forests were illegally cleared drove 25% of all tropical deforestation between 2000 and 2012. The study estimates that almost 40% of all palm oil, 20% of all soy, nearly 33% of tropical timber, and 14% of all beef traded internationally comes from land that had been illegally deforested. Nearly one-fifth (17%) of Brazilian beef, 75% of Brazilian soy, and 70-80% of the palm oil and plantation wood and pulp from Indonesia were destined for foreign markets. “Five football fields of tropical forest are being destroyed every minute to supply these export commodities,” said Lawson, noting that the report’s figures were obtained using conservative estimates based on documented violations of significant impact. “There is hardly a product on supermarket shelves that is not potentially tainted,” he added. While the study highlights Brazil’s recent success in reducing illegal forest clearance, the report also cautions that the problem of illegal deforestation for the production of commodities intended for export is now expanding to new areas of the tropics where deforestation rates have traditionally been low — and that the same illegalities seen elsewhere are being repeated. In the Congo Basin, for instance, two out of the three largest new oil palm projects currently under development have been found to be operating illegally; one of these plantations, in the Republic of Congo, is set to double that country’s deforestation rate. The report documents governance failures that undermine broader efforts to tackle tropical deforestation, including private sector initiatives on sustainable commodities and efforts by tropical forested countries to reduce legal deforestation. It argues that while the recent spate of “zero deforestation” commitments by major consumer goods companies involved in producing, trading, or consuming relevant commodities is to be applauded, illegalities relating to consumer agriculture and timber plantations can ultimately only be fully addressed by governments, and efforts to go further than legality will be held back by the need to compete with products that were illegally produced. The report includes a range of recommendations for countries that both produce and import agricultural commodities, as well as corporations and investors in the commodity trade. The report advises producer countries, for example, to simplify and harmonize contradictory laws and regulations, including those pertaining to land use and securing tenure for Indigenous Peoples and other local communities to reduce conflicts. It asserts that governments should enforce these laws and hold companies investing in these countries accountable. Another set of recommendations call for actions by the governments of countries that import the commodities concerned. The report notes that important lessons can be learned from previous successful initiatives to combat the trade in illegally sourced timber. Producer countries — particularly those developing trade agreements with the EU (FLEGT VPAs) — are clarifying regulatory frameworks that improve their ability to demonstrate the legality of wood products to their citizens. Consumer countries are instituting measures that have been shown to support the enforcement of producer countries’ own laws and regulations, including the development of importing trade legislation (such as the EU Timber Regulation), public procurement policies, and investment standards. However, there has been limited analysis to date on how similar mechanisms for agricultural commodities could leverage credible legal compliance, support sustainable land use policies, and increase transparency. If water trends with Mexico continue, researchers warn that Texan citrus production could drop to zero. Faced with climate change and diminishing opportunities to expand productive agricultural acreage, the world needs to invest in a global research agenda addressing farm and food systems, landscape and regional issues and institutional and policy matters if it is to meet the growing worldwide demand for food, fiber and fuel, suggests an international team of researchers. In a paper appearing online in the journal Agriculture and Food Security, the authors summarize the findings of the second international Climate Smart Agriculture conference held in March 2013 at UC Davis. “Climate-smart agriculture has become a global policy initiative for economic development, poverty reduction and food security,” says lead author Kerri Steenwerth, a U.S. Department of Agriculture soil scientist and adjunct professor in the UC Davis Department of Viticulture and Enology. “It makes sense for farmers, consumers and food businesses because it is focused on the long-term sustainability of supply chains, and applies both to farmers’ fields and to the natural landscape,” she said. The objectives recommended in the new paper set the stage for a stronger emphasis on moving knowledge into action and involving researchers in helping communities and societies to change and adapt. Steenwerth has posted a blog entry about the paper on the Biomed Central blog. The blog and the paper were supported by the UC Davis College of Agricultural and Environmental Sciences. A third global science conference on Climate-Smart Agriculture is scheduled to be held March 16-18, 2015 in Montpellier, France. The above story is based on materials provided by University of California – Davis. The original article was written by Andy Fell. Note: Materials may be edited for content and length. Congress broke for the August recess on Friday and won’t be back in the Capitol until Sept. 8. One of the many pieces of legislative business left at a standstill is the Fiscal Year 2015 agriculture appropriations bill, which funds the Department of Agriculture and the Food and Drug Administration. The House of Representatives began debate on its version of the bill on June 11 but has not returned to it on the floor since. One reason is that Majority Leader Eric Cantor’s (R-VA) loss in his re-election primary race and decision to step down as leader changed the floor dynamics. In addition, there was uncertainty about having enough votes to pass the bill considering the school nutrition provisions that Democrats so vehemently opposed. On the Senate side, the ag appropriations bill was grouped with the Commerce-Justice-Science and the Transportation, Housing and Urban Development appropriations bills into a “minibus,” which was first expected to be brought up for a floor debate the week of June 16. The minibus has yet to make it to the floor, mainly because of disagreement between Majority Leader Harry Reid (D-NV) and Minority Leader Mitch McConnell (R-KY) concerning amendments. Fiscal Year 2015 begins Oct. 1, so the House is considering a vote on a short-term continuing resolution in September that would fund the federal government at current levels until mid-December. After the midterm election on Nov. 4, Congress could vote on a FY 2015 omnibus bill or a second continuing resolution that funds the federal government for the rest of the next fiscal year, or until Sept. 30, 2015. Just as a leaky roof can make a house cooler and wetter when it’s raining as well as hotter and dryer when it’s sunny, changes in land use can affect river flow in both rainy and dry times, say two University of Iowa researchers. While it may be obvious that changes in river water discharge across the U.S. Midwest can be related to changes in rainfall and agricultural land use, it is important to learn how these two factors interact in order to get a better understanding of what the future may look like, says Gabriele Villarini, UI assistant professor of civil and environmental engineering, assistant research engineer at IIHR — Hydroscience & Engineering and lead author of a published research paper on the subject. “We wanted to know what the relative impacts of precipitation and agricultural practices played in shaping the discharge record that we see today,” he says. “Is it an either/or answer or a much more nuanced one? “By understanding our past we are better positioned in making meaningful statements about our future,” he says. The potential benefits of understanding river flow are especially great in the central United States, particularly Iowa, where spring and summer floods have hit the area in 1993, 2008, 2013 and 2014, interrupted by the drought of 2012. Large economic damage and even loss of life have resulted, says co-author Aaron Strong, UI assistant professor in the Department of Urban and Regional Planning and with the Environmental Policy Program at the UI Public Policy Center. In order to study the effect of changes in agricultural practices on Midwest river discharge, the researchers focused on Iowa’s Raccoon River at Van Meter, Iowa. The 9,000-square-kilometer watershed has the advantage of having had its water discharge levels measured and recorded daily for most of the 20th century right on up to the present day. (The study focused on the period 1927-2012). During that period, the number of acres used for corn and soybean production greatly increased, roughly doubling over the course of the 20th century. Not surprisingly, they found that variability in rainfall is responsible for most of the changes in water discharge volumes. “Our results suggest that changes in agricultural practices over this watershed — with increasing acreage planted in corn and soybeans over time — translated into a seven-fold increase in rainfall contribution to the average annual maximum discharge when we compare the present to the 1930s,” Villarini says. The UI research paper, “Roles of climate and agricultural practices in discharge changes in an agricultural watershed in Iowa,” can be found in the April 15 online edition of Agriculture, Ecosystems & Environment. The above story is based on materials provided by University of Iowa. The original article was written by Gary Galluzzo. Note: Materials may be edited for content and length. A Colombian agricultural development body will work with other South American countries to strengthen the industry.